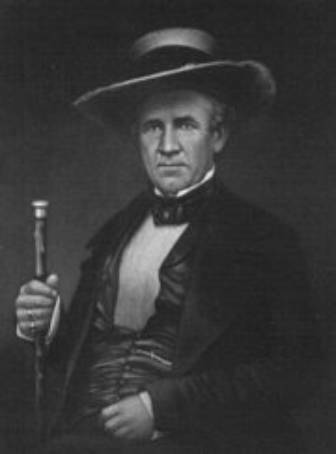 As night fell on the evening of April 19, 1836, Sam Houston's ragged army was moving along the south bank of Buffalo Bayou toward Lynch's Ferry across the San Jacinto River. Since abandoning Gonzales on March 11, Houston had retreated eastward, pausing only twice to rest and train his troops. 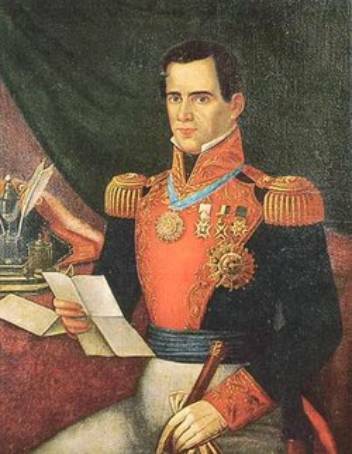 Officials in the interim government and critics in his army had continually urged him to stand and fight the advancing Mexican Army of General Antonio Lopez de Santa Anna, the President of Mexico and the self-styled Napoleon of the West. Many Texans called for Houston's removal as commander-in-chief for reasons of cowardice in refusing to meet the enemy. Unmoved, Houston kept retreating, buying time and looking for an advantageous opportunity. Recognition of the opportunity came in the pre-dawn hours of April 19. Houston arrived on Buffalo Bayou, opposite Harrisburg on April 18, finding the town in smoldering ruins. Santa Anna had already been there. After midnight that night, Houston learned from documents carried by a captured Mexican courier that Santa Anna had set out for New Washington, on Galveston Bay, in pursuit of the interim Texas government, and that he planned to proceed to Lynch's Ferry. Houston realized that Santa Anna, in his relentless pursuit, had isolated himself from the main body of his army, which was still west of the Brazos River. The time to fight had come, but Houston must get to Lynch's Ferry first. On the 19th, leaving the army's baggage and the sick under guard, he crossed his troops to the south bank of Buffalo Bayou, turned east across Vince's Bridge, and marched into the growing darkness of the dying day toward the San Jacinto and destiny. The dawn broke cold and gray on April 20. Houston's army continued eastward, tramping through the mire left by heavy spring rains. An advance cavalry guard arrived at Lynch's Ferry about midmorning and found a detail of Mexicans guarding a flatboat filled with provisions. The Mexicans fled as the Texans approached, abandoning the boat that Santa Anna had sent up the San Jacinto River in anticipation of his arrival. The captured provisions were to be welcomed by the starving Texans, who had lived for days on meager rations. The remainder of the army soon arrived and set up camp in a stand of timber skirting Buffalo Bayou about a mile from the ferry crossing. The troops were deployed along the bayou for about 500 yards, behind a low rise along which ran the road to the ferry. Two volunteer regiments of infantry guarded the left, the regular infantry the right, and the cavalry deployed on the far right flank. In the center, at the top of the rise, the artillery positioned the Twin Sisters, a pair of six-pound cannons, recently received from the citizens of Cincinnati, Ohio. Around 20 or 30 campfires stood as many groups of men: English, Irish, Scots, Mexicans, French, Germans, Italians, Poles, Yankees, all unwashed and unshaved, their long hair and beards and mustaches matted, their clothes in tatters and plastered with mud. A more savage looking band could scarcely have been assembled. Yet many were gentlemen, owners of large estates. Some were distinguished for oratory, some in science, some in medicine. Many had graced famous drawing rooms. Their guns were of every size and shape. They numbered less than 800 men. Houston quickly dispatched a small cavalry detail toward New Washington to reconnoiter Santa Anna's position. They found the Mexican Army preparing to leave the burned out town, skirmished briefly, and hastily retraced the eight miles back to Lynch's. The Mexican Army was not far behind, arriving just before noon. Santa Anna immediately attempted to draw the Texans into battle. He positioned his single twelve-pound cannon, the Golden Standard in a grove of trees 400 yards in advance of the Texan camp and commenced firing. Houston responded with volleys from the Twin Sisters. A Mexican infantry company advanced to the cover of another cluster of trees within rifle shot of the Texan left flank. After a brief exchange of rifle fire, a shower of grapeshot and broken horseshoes from the Twin Sisters drove the riflemen into retreat. As the artillery cannonade continued sporadically into late afternoon, Santa Anna began establishing his camp on a rise overlooking the marshes lining the San Jacinto River, about three-fourths of a mile east of the Texan position. Realizing that the Texans were almost equal in number to his own 1,000-man force and had somehow obtained artillery, Santa Anna fortified his position by ordering breastworks of pack saddles, trunks, and other baggage erected in front of the camp. He had suddenly lost his normal advantage of overwhelming numbers, and must now wait for reinforcements. Shortly before sunset, Santa Anna ordered the Golden Standard withdrawn from the field. At about the same time Houston sent a small cavalry detail to survey the Mexican position. They encountered a Mexican unit deployed to cover the artillery withdrawal and a heated skirmish ensued. The undisciplined Texans fell back in confusion and disarray narrowly escaping disaster with only one man mortally wounded. Private Mirabeau B. Lamar displayed such heroics in rescuing unhorsed comrades during the foray that he was promoted to colonel and given command of the Cavalry Company. As the sun set, both armies settled into camp for the night. It was a long night for both commanders. Houston ordered his men to eat and rest, but he remained awake all night, as he often did. He faced a serious dilemma; he had his enemy isolated with a nearly equal force, and he could not let him escape. But his own army worried Houston - an army of strong-willed individualists, filled with restless vengeance, and angered by his orders of continued restraint. That they would fight, he could not doubt, but the lack of discipline displayed in the cavalry skirmish that afternoon indicated that once in battle the little training he had given them would be for naught - they would be beyond his control. Santa Anna, too, did not sleep, nor did he let his troops rest. He understood his predicament, and he feared the ill-tempered mob of wild-eyed Texans, bent on avenging his past actions at the Alamo and Goliad. Although better equipped and more disciplined than his adversary, his army of peasants and Indians had marched over a thousand miles exposed to the harshness of a late Texas winter and an uncommonly wet spring. They were nearing exhaustion, but this night they must remain awake and alert, for Santa Anna knew that his enemy would attack at the day's first light. Dawn of April 21 came, but Houston did not attack. Santa Anna began to relax. In the Texan camp, Houston's troops arose early and busied themselves with breakfast. They wanted to fight, but their commander still refused. At 9:00 Santa Anna's prayers were answered, and his fears allayed. His brother-in-law, General Martin Perfecto de Cos, arrived with 500 reinforcements, giving him an almost two-to-one numerical advantage. Tension broke in the Mexican camp. Santa Anna ordered his army to eat and rest. He was so confident that he did not even keep sentries posted. He knew the field was his - the Texans would not dare attack such a superior force. News of the arrival of more Mexican troops spread quickly through the Texan camp, further agitating frustrations. Shortly thereafter, Houston sent Erastus "Deaf" Smith and six others to destroy Vince's Bridge, in an effort to delay possible further reinforcement. About noon, he assembled his officers and held his first and only council of war. The officers emerged from the meeting confused and disappointed, for nothing had been resolved. But Houston knew that he could no longer hold his men in check. He must let them fight - ill trained and outnumbered - against his superior foe. At 3:30 Houston called for a parade assembly, inspected the men, and deployed them into a battle line. Colonel Sidney Sherman's volunteer infantry would follow along the edge of the marshland and strike from the left, while Colonel Lamar's cavalry would circle to the right to confront the Mexican cavalry. Houston joined the main force of Colonel Edward Burleson's volunteers, Colonel Henry Millard's regulars, and Colonel George W. Hockley's artillery to launch a frontal attack against the breastworks. Just after 4:00 on that warm afternoon, with the sun at their backs, the Texans stepped forward in a slow and silent advance toward the Mexican lines. Their only advantage would be the element of surprise. In the Mexican camp, the scene was one of relaxation and confidence in the safety of numerical superiority. Most of the troops slept, some were cooking and eating, others playing cards, rifles were stacked, and Santa Anna was in his tent. Suddenly a soldier noticed the advancing Texans and sounded the alarm. The Texans had moved to within 200-300 yards of the barricades when the alarm sounded. The Twin Sisters immediately boomed and the Texans charged, holding their fire until within sixty yards of the Mexican line. Someone shouted "Remember the Alamo! Remember Goliad!" At first a few, then all, joined in that cry of vengeance. Houston's horse was shot from beneath him - he mounted another. The fight was hand-to-hand combat at the breastworks. Houston fell wounded, but he mounted yet again. Sherman swamped the left; Lamar overwhelmed the cavalry on the right; Burleson and Millard overran the breastworks and captured the Golden Standard. Within eighteen minutes all organized resistance had collapsed. The Mexican soldiers dropped their weapons and fled into the marshes toward the San Jacinto, hoping to swim to safety. Colonel Juan Almonte valiantly rallied a few of the disorganized troops, but his resistance swiftly disappeared under the onslaught. Many terrified soldiers huddled together for protection, signaling surrender, but were decimated by rifle butts wielded as clubs and even the bayonets of their own discarded rifles. Others stumbled and fell in the quagmire shouting "Me no Alamo! Me no Goliad!" For many, those were the last words of their lives. Houston and many others, officers and soldiers alike, tried to stem the tide of revenge, but failed. Just before sunset, over two hours after the battle began, the killing finally stopped. The shallow waters of the marshes ran crimson. Over 600 Mexican soldiers lay dead, with over 200 wounded. Texan casualties, in the heated action, numbered only 8 (dead) and thirty (wounded). The 700 surviving and unscathed Mexicans on the field were gathered and placed under guard. A small number escaped, including Santa Anna. Once he realized that his army was beaten, the Mexican president mounted a horse and fled westward, seeking the safety of his remaining forces beyond the Brazos River. The few men with medical experience began tending the wounded, first the Texans, then the Mexicans, as best they could with meager supplies. Houston's wound was more severe than anticipated. A rifle ball had shattered his ankle; he would be crippled for several months. A field hospital was established at Lorenzo de Zavala's plantation across Buffalo Bayou. All through the night, the air was pierced by the agonizing wails of the wounded and the dying. On the morning of the 22nd, the Texans buried their dead in their camp along the bayou. Houston dispatched riders to notify the soldiers protecting fleeing settlers to return, and sent scouts searching for escaped Mexicans, especially Santa Anna. Houston knew that if his foe reached his 3,000-4,000 troops west of the Brazos that the war would continue. Before noon, a group of scouts under Sergeant James Sylvester captured a Mexican private near Vince's Bridge. Upon returning to camp, passing the prisoners' compound, several surviving soldiers shouted "El presidente! El presidente!" They had captured the Napoleon of the West. Santa Anna was brought to Sam Houston, lying wounded beneath a live oak tree at the edge of the bayou. The conquered dictator agreed to cease hostilities and dispatched orders to his remaining field commanders to withdraw their troops from Texas. The battle was won, independence secured, and the new Republic of Texas joined the realm of nations. 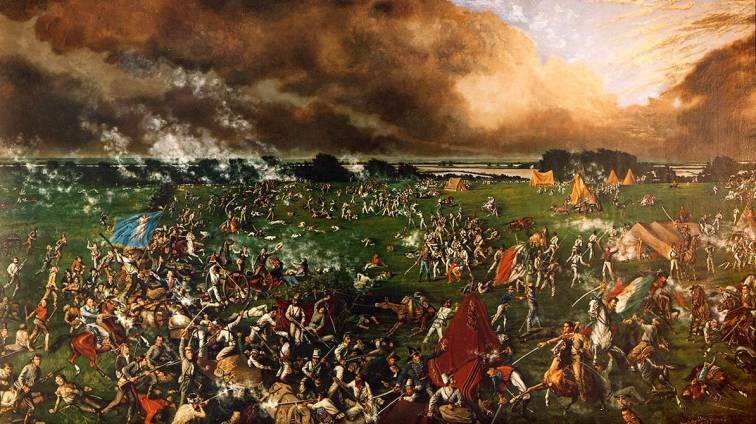 The battle at San Jacinto helped to establish "The Republic of Texas" that flourished for a decade. The Republic eventually added over one million square miles of territory to the United States. From this vast territory came the states of Texas, New Mexico, Arizona, Nevada, California, Utah, Colorado, Wyoming, Kansas and Oklahoma. San Jacinto (CG-56) was laid down 24 July 1985 by Ingalls Shipbuilding, Pascagoula MS; launched 14 November 1986 and christened 24 January 1987 by her sponsor, Dr. Wendy Lee Gramm, wife of Senator Phil Gramm of Texas. 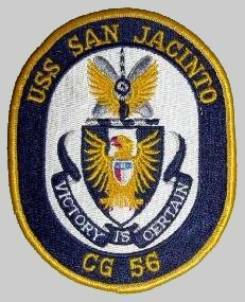 San Jacinto was commissioned on 23 January 1988 by then Vice President George Bush in Houston, Texas. 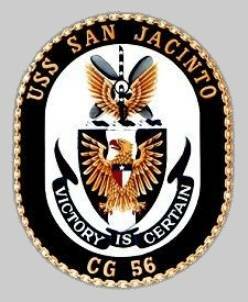 In the first eleven years since her commissioning, San Jacinto won every major award for which she was eligible. These included the Battenburg Cup, which recognized her as the best ship in the Atlantic Fleet, and an unprecedented six consecutive Battle Efficiency ("Battle E") Awards. She won and was a subsequent runner-up in the Atlantic Fleet Golden Anchor competition recognizing her superior quality of life and retention programs. Other unit awards included the Joint Meritorious Unit Award, the Navy Unit Commendation, and the Meritorious Unit Commendation. 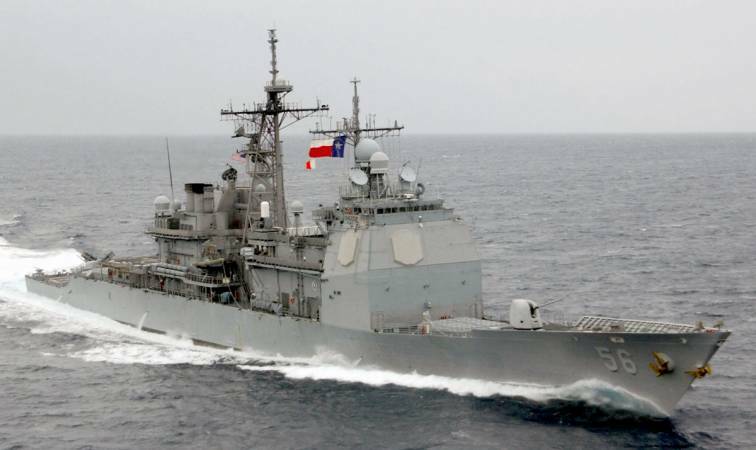 San Jacinto distinguished herself by a 1989 Mediterranean deployment where she provided the strike warfare capability supporting the first Mediterranean aircraft carrier gap in recent history. In August 1990, San Jacinto deployed with only five days notice for Operation Desert Shield, where she served as Red Sea Battle Force Air Warfare Commander and launched the first Tomahawk Cruise missiles ever fired in combat during the opening salvos of OPERATION DESERT STORM. 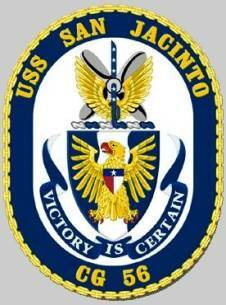 In 1992, San Jacinto circumnavigated South America during UNITAS XXXIII, a multi-national naval exercise. Many of the littoral warfare tactical initiatives developed during UNITAS were later refined during BALTOPS '93 exercises when San Jacinto embarked the first-ever LAMPS SH-60B and SH-60F combined detachment. 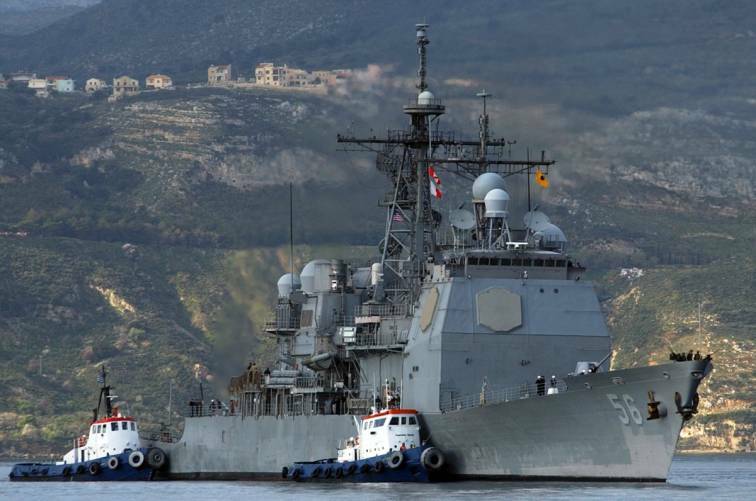 San Jacinto deployed to the Mediterranean and Red Sea in 1994 as part of the George Washington Battle Group. During her 69 days in the Adriatic Sea, she enforced the "No-Fly Zone" over Bosnia-Herzegovina and the UN sanctioned arms embargo. 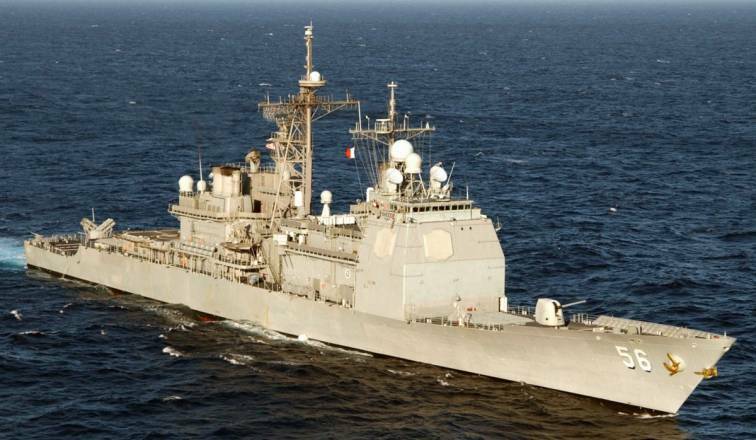 When Saddam Hussein sent his forces once again towards Kuwait in October of that year, San Jacinto responded rapidly, taking Tomahawk Strike station in the Red Sea just as she had three years earlier. In 1998, San Jacinto deployed with the John C. Stennis (CVN-74) to the Arabian Gulf. Following a 16-day transit, the San Jacinto served as the Air Warfare Commander for the John C Stennis Battle Group and Regional Air Warfare Commander for the Arabian Gulf. 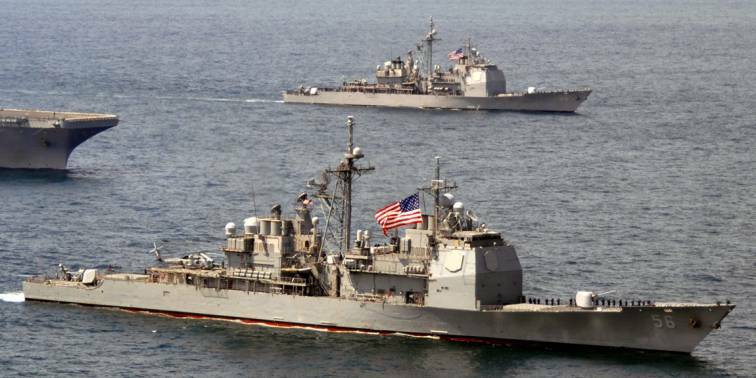 Additional taskings included as part of Operation Southern Watch and Maritime Interdiction Operations in support of UN Resolutions and sanctions against Iraq, defense of the Stennis as "Shotgun Cruiser", and a rescue at sea of a Turkish merchant vessel. Upon its return home, and with the the Stennis’ move to the West Coast, the San Jacinto was reassigned to the Harry S Truman (CVN-75) Battle Group. 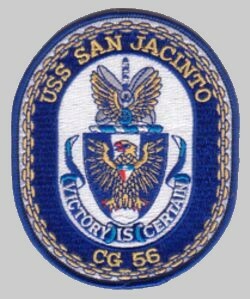 In its available inter-deployment time, the San Jacinto went to New York City for Fleet Week ’99. 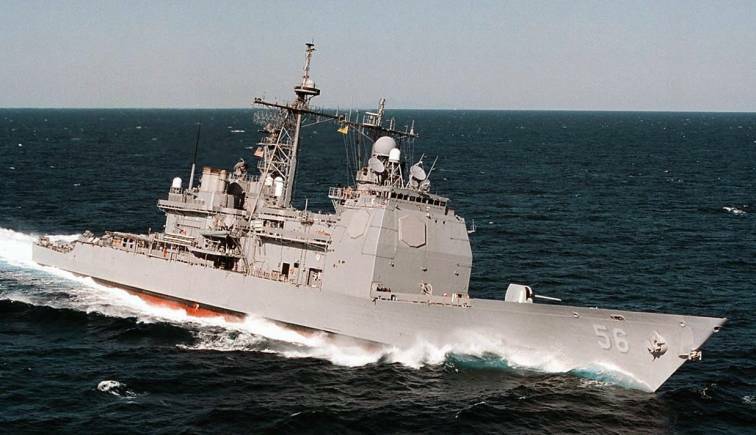 The guided missile cruiser San Jacinto deployed in late November 2000, for six-months to the to the Mediterranean Sea and the Arabian Gulf in support of Operation Southern Watch. 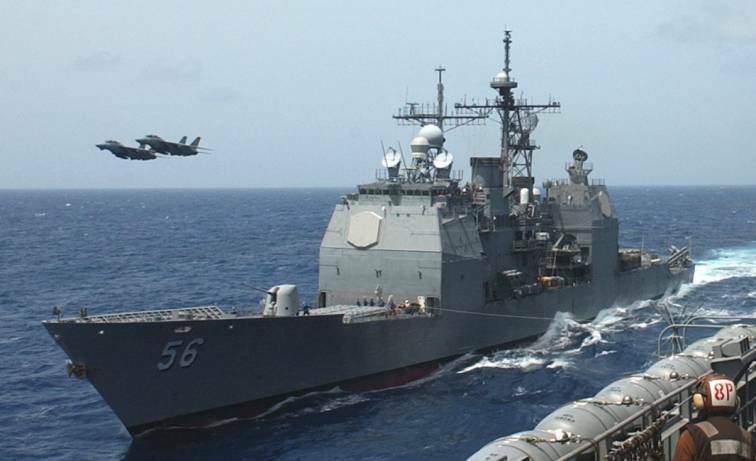 Prior to that deployment, the cruiser took part in Joint Task Force exercise 01-1 and NATO exercise Unified Spirit 2000. 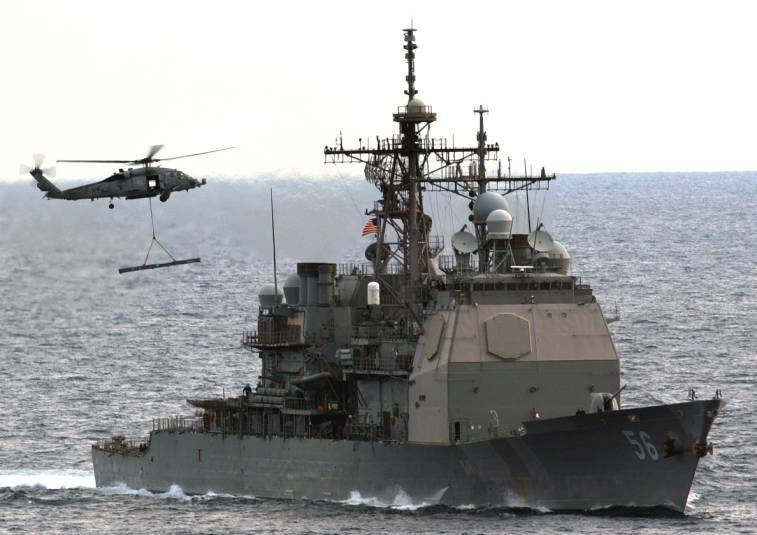 As the Air Warfare Commander and only AEGIS cruiser in the Harry S Truman Battle Group, San Jacinto used its SPY-1 Radar and command and control communications suite to help maintain regional stability through the enforcement of the Iraqi Southern ‘No-Fly’ zone and the conduct of Maritime Interception Operations in the Northern Arabian Gulf. 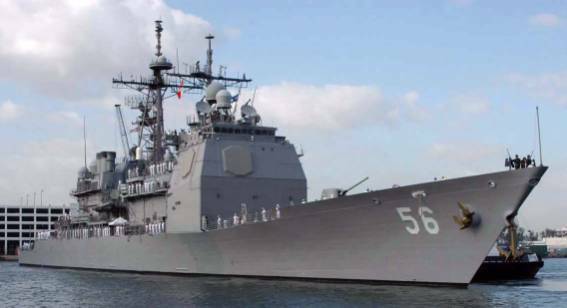 It returned to its homeport of Norfolk, Virginia in late May 2001. In December 2002, SAN JACINTO deployed to the Mediterranean and Red Sea as the Air Defense Commander (ADC) for Harry S. Truman (CVN 75) and later during Operation Iraqi Freedom to include the USS Theodore Roosevelt (CVN 71) Strike Group. As ADC, San Jacinto was responsible for defending the ships of Task Force Sixty against air or missile attack and management of air traffic within an extremely confined area as two aircraft carriers conducted flight operations around the clock. 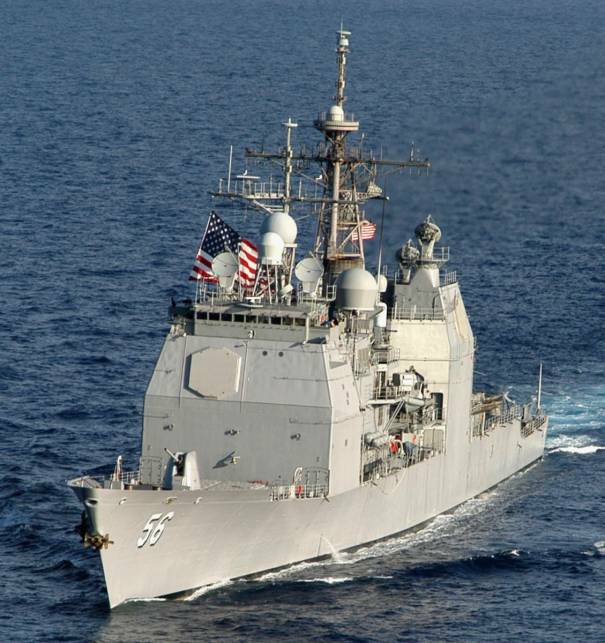 From March 15 to March 28, San Jacinto operated in the Red Sea, supporting the Commander, United States Fifth Fleet. 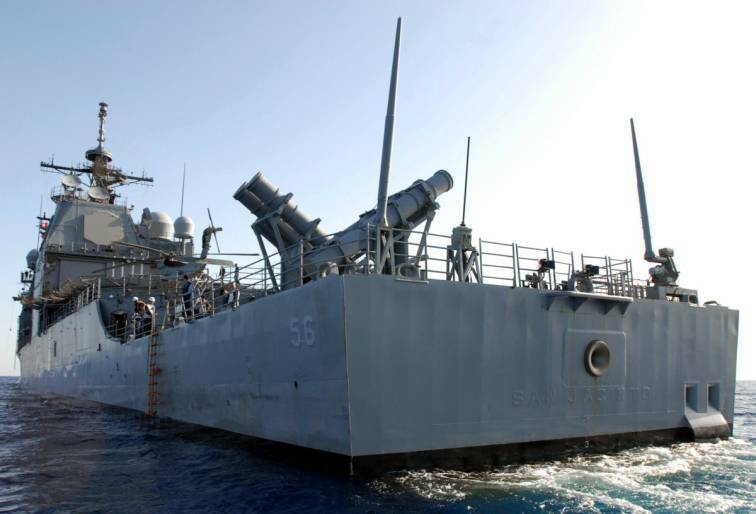 It was during her Red Sea Operations that San Jacinto fired 29 Tomahawk Land Attack Missiles against targets in Iraq - the most missiles launched by any ship in the Red Sea. 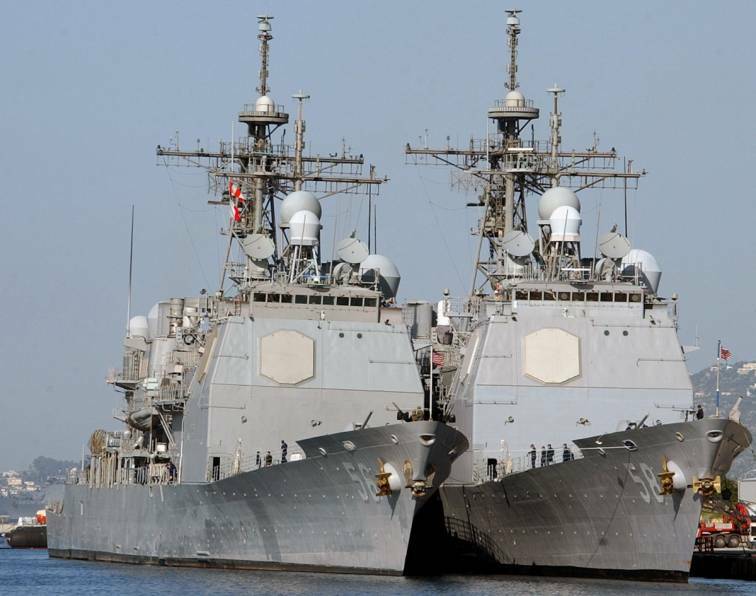 The ship’s boarding teams conducted a series of inspections designed to ensure that vessels were not involved in the support of Al Quaeda or other terrorist organizations, and to deter other vessels from offering terrorists safe haven or support.